I am not so sure, what I expected when I was prompted to review this game, certainly not much. 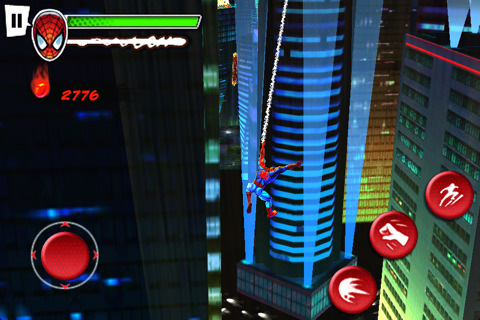 Oh surprise surprise, Spiderman Total Mayhem is a spectacular game for the iPod Touch and iPhone. One that actually captures the web slingers adventures and puts it into a small version to carry around with you. I almost could not stop playing this surprisingly well-done game app. Things kick off with a bang for our webbed wonder when several of the super villains from Spider-Man’s past escape from prison. Of course, it is up to Spider-Man to put them back where they belong. It is a simple story but for such an action beat-up the bad guy game, you do not really need Hemingway. 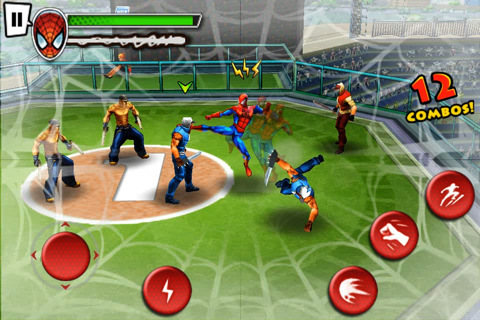 Gameloft brings a spectacular game to the portable platform. Where many games created for iPod Touch and iPhone have strong licenses going for them, they just do not feel right. They often feel and play as if the game concept was some half-baked concoction that just tacks on the name and graphics of a powerhouse license in after thought. 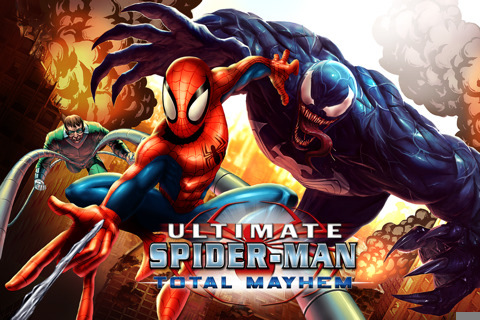 Not so, with Spider-Man Total Mayhem, the game comes off well polished and story driven and actually brings that feel of being Spider-Man to a portable device. With game levels and game play that are surprisingly spectacular and varied enough to keep up the interest. Controlling Spider-Man is very fluid and simple. Fighting in the game with strings of Spider-Man like combos is very satisfying. 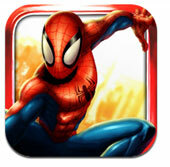 Levels are large and detailed, any Marvel fan will be darn happy to have this game on their iPhone or iPod Touch. Jump on over to iTunes and grab this game and have a blast. This is how a game license should be utilized on the portable platform.